The North Country Charter Academy held its 2014 graduation ceremony for some 35 vibrant students last Sunday at the Mt. Washington Hotel. 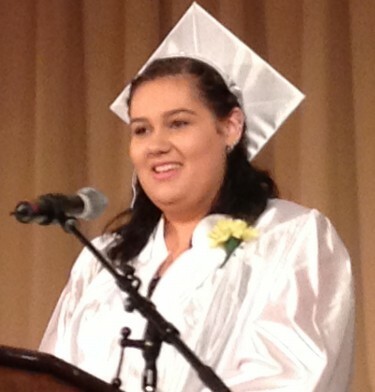 In place of a valedictorian, NCCA featured a parent and five students telling their stories. The next several posts will be those speeches, written entirely by the speakers. Hi, my name is Sonseehray Flores and I wanted to share with you how I came to the charter and how it has affected my life. In April 2012 I left BHS and went to the Charter Academy. I had needed 14 credits and had lost all faith in myself and my abilities. I moved from California to New Hampshire due to domestic violence when I was 14 and in the 8th grade I was severely bullied and it continued on into high school. It wasn’t as bad in high school but none the less it still affected me. I developed severe depression and anxiety from things that had stemmed back as far as when I was a child. Every year I would go on telling myself this year would be different but then eventually someone would say something and after a while I just shut down. I wouldn’t be able focus and all I wanted to do was get through the day, go home and draw myself into my music or sleep. Until one day I woke up, I was 18 sitting in the hallway crying. One of my favorite teachers has just told me that he didn’t think I would be able to graduate on time, and then he repeated what I had heard but never really absorbedyou are a very smart person Sonny, I don’t know why you won’t just apply yourself. That’s when I got offered to go to the charter and it was the second chance I desperately needed. Being at the charter taught me more than academics. They pushed me to work hard and strive to be the best possible version of myself and accepted nothing less. I will always be eternally grateful for Mr. K’s tough love, Mr. Kelly’s pep talks when it felt like the world was against me and Mrs. Ryder for always being there when I needed a friend, having faith in me when I lost faith in myself. Never giving up on me no matter how stubborn I was. Today I am 20 and standing in front of all of you about to receive my diploma. It may have taken longer than most but what they taught me is all that really matters is that I got back up and got there. I may not know what my future holds but what I do know is that as long as I get back up and keep moving forward that I can accomplish anything. Thank you for helping me find within me the courage to continue.